Amazing! We had over 231 entries into the Easy Veggie Meal Plans Blog contest. 1) Reiynne - She’s struggled for years to find the right meal plans for her vegan lifestyle, and loved the sample plans Kardena made. Plus, she’s going to show all the trainers at her gym that you can get fit and lean without meat! 2) Mario - Mario is sick of hearing about another tainted meat scandal and no longer thinks meat is safe to eat, so Marios is going to eat a healthier diet and transform using the Veggie Meal Plans. 3) Shaunda - She has struggled with Jenny Craig, the WW point system, South Beach, Atkins, and all those fad diets. But nothing has helped, until now! And she noticed all her vegetarian friends have a healthy glow – so Shaunda is going to become a Veggie Meal Plans success story! 4) Hannah - She recently discovered her skin eczema is due to dairy, and as a busy mom (of 3 kids) she has not had success in returning to her pre-baby body. But she will with the Veggie Meal Plans. 5) Ann - After 28 years in the military, Ann added 25 pounds and has not been able to find the right LIFESYTLE to lose it…she feels like a prisoner to food, but knows that a vegan plan is the best way to eat. Soon she’ll be an Easy Veggie Meal success story. Thanks to everyone who entered. We really appreciate YOU and your feedback…it has given us so many ideas for future articles and videos for the blog. And the Easy Veggie Meal Plans will be available in a HALF-PRICE sale starting on Monday, July 27th! My most favorite product ever. 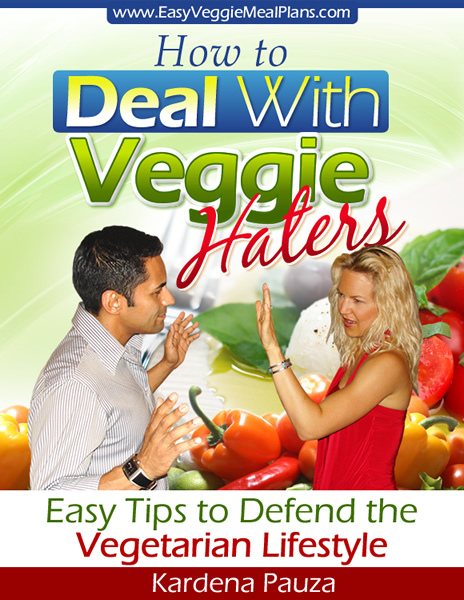 It’s called the “Defend Your Diet Against Veggie Haters” coaching call, and I truly feel it could be the most powerful product I ever helped create. You’ll even get to hear from Kardena’s husband Mark about his veggie weight loss story and how he deals with his buddies from Jersey who hassle him about his diet. PS – Discover How You Can Get the Easy Veggie Meal Plans for Half Price! Sit back and join me on my couch as I share with you EVERYTHING that will be in this revolutionary new Veggie Meal Plans program, including the Quick Start Guide, the “How to Defend Your Diet Coaching Call”, and the Fast Action Smoothies Bonus. A wonderful help to the meal plan would be a shopping list….and where to find some of the new Vegi options listed! Local grocery stores don’t offer many options outside of tofu! I ordered your plan and I have a question. Is the dressing supposed to be one serving? You say the total calories for this meal is supposed to be 355 calories, however, your dressing calls for 3 tablespoons of olive oil and according to the label on my bottle of extra-virgin olive oil one serving is 1 tablespoon at 120 cal, so 3 tablespoons would be 360 calories. I didn’t use all of this dressing as it made almost 4 ounces, way too much dressing for 3 cups of spinach. You might want to clarify if the quantity of olive is correct or if this is to serve as more than one serving. Hello ~ Is there anything you would suggest for gluten free products? Do you think if I replaced the glueten free breads with wheat I will still get the good effects? Hi Shannon, different grains that are gluten free would work just fine. Do you eat only raw foods? Or is a vegan diet that cooks the food acceptable also? I LOVE eggplant……but I cook it ….. I do my best to eat raw foods, but there I are certain things I do eat cooked. Sometimes we eat eggplant cooked also. Do your best and eating cooked veggies is 110% healthier than 99.8% of people out there right now.